TO St. Francis Xavier and his Jesuit brethren China owes more than to any other body of missionaries. To this day the Roman Catholic missions are strong and widely spread in the empire of the yellow race. The first to preach Protestant Christianity in China were missionaries from America in 1834, and from the London Missionary Society, which sent out Robert Morrison in 1807. The C.M.S. followed in 1844 and the S.P.G. in 1863. The Chinese — a word probably derived from the native Jin = men — is usually divided into (1) Wen-li, or classical (High Wen-li and Easy, or Low, Wen-li); (2) Mandarin colloquial (Northern: Peking and Shantung, and Southern, or Nanking); (3) some seventeen other colloquials, among which the dialects of Canton, Foochow, Hakka, Hangchow, Shanghai, etc. Editions of the Liturgy are printed generally in Chinese character, though some of the colloquials are in roman letters. Robert Morrison, of Morpeth, England, the father of Protestant missions in China, was born in 1782. He was accepted in 1804 as a missionary candidate by the London :Missionary Society, and at the age of twenty-two removed to their Seminary at Gosport. In 1807 he was ordained as a missionary to China. He landed at Macao, by way of New York, September 4, 1807. Expelled from there by the Portuguese consul, he went to Canton. When the British were expelled from Canton, he retired with them to Macao. In 1809 he became translator to the East India ’Company, a post which gave him a secure footing in China. Morrison was the author of many well-known works of a philological character; chief among them his translation of the Imperial Chinese Dictionary into the English language, and further, his translation of the Bible into High Wen-li. He died at Canton in 1834, and was buried at Macao. He was the author, also, of translations of hymns and of portions of the Prayer Book. The title of the latter reads: Neen chung mei jih tsaou wan ke taou seu shih: The Morning and Evening Prayers of the Liturgy of the Church of England. Translated into Chinese by Dr. R. Morrison. Canton. Published by the Prayer Book and Homily Society. [1818?] 8vo. It was preceded by the Psalter, and the common title-page reads: The Psalter, together with the Order for Morning and Evening Prayer, from the Church of England Liturgy. Translated by R. Morrison. In 1848 there was published, at London, the sixth edition of a Compendium of the Book of Common Prayer, translated into Chinese by Dr. Morrison, 8vo, of which the first edition, 1829, reads: Ying-keīh-le kwō shin hwuy ke taou wăn ta kae fan yĭh Han tsze. The United Prayers and Supplications to God of the English Nation, translated into Chinese. A Compendium of the Book of Common Prayer, by Ma [i.e., Dr. R. Morrison]. In 1830 (?) appeared: Shing hwuy taou sze. The Liturgy of the Holy Church of England. 8vo. In this connection it may not be out of place to mention the translations made by Dr. Boone, the first missionary bishop to China, appointed by the Protestant Episcopal Church of the United States of America. They are in the Shanghai colloquial, and were published at Shanghai in 1849. 8vo. They are entitled: Chow neen tsaou shin taou kaou shĭh. The Morning Service of the English Liturgy, translated into the Shanghae Dialect; and: Chow neen yay le taou kaou shĭh. The Evening Service of the English Liturgy, translated into the Shanghae Dialect. William Jones Boone (1811-64) was noted for scholarship in the Chinese language and literature, and did eminent service in securing an accurate version of the Holy Scriptures and of the Prayer Book into that tongue. He began his work of translating the Liturgy in 1846, two years after his consecration as missionary bishop of Shanghai and the Valley of the Yangtsee river. He was assisted by the Rev. Cleveland Keith († 1862). In 1855 there appeared at Hongkong: Taou kaou wăn ts’euen shoo. The Book of Common Prayer, &c. 8vo. It was printed at St. Paul’s College. The translator, Walter Henry Medhurst, was born in London, April 29, 1796. By profession a printer, he entered as such the service of the London Missionary Society. He embarked for China in 1816 as a missionary printer, his destination being Malacca. He made rapid progress in the study of the Malay and Chinese languages and developed a faculty for preaching. He was accordingly ordained by Dr. William Milne (1785-1822), and his colleagues at Malacca on April 27, 1819. When the ports of Canton, Shanghai, and of three other cities were opened to British merchants by the treaty of August 29, 1842, Medhurst removed to Shanghai, and laboured there for fourteen years as the senior missionary. In 1856 he returned to England, and died a few days after his arrival in London. Dr. Medhurst had a more intimate acquaintance with the Chinese character and a more extended knowledge of the language than any of his associates. His. translations were printed by the thousand, and large quantities were sent in the emigrant ships which took crowds of Chinamen to the Californian and Australian goldfields. A recent edition of the Foochow translation of the Prayer Book, by the S.P.C.K., contains title (2 pages), preliminary matter (44 pages, beginning with a table of contents), and 472 pages of text, crown 8vo. A year before the original appearance of Medhurst’s translation there was published: Yay-soo shing keau-taou kaou wan. The Morning and Evening Prayers of the Church of England, 8vo. This most probably was the first draft made by Robert Henry Cobbold, B.A., Peterhouse, Cambridge, 1843, who went out to Ningpo in 1845. He was· archdeacon of Ningpo, 1856-58, and then returned to· England, where he died in 1893. It was about 1860 that the romanized system of transliteration and printing of Chinese was adopted. It was found that Wen-li, the written language, was known only to the educated few; that the masses could not be reached by it, and that it was easier for an illiterate Chinaman to· learn the roman alphabet. Hence was undertaken the difficult task of transliteration, or, rather, reducing the spoken language to writing with roman letters. This has· proved, in some districts, a very successful method of instructing the humbler classes. In the Ningpo dialect large portions of the Scriptures, the Prayer Book, etc., were in after years printed in roman characters, mainly through the efforts of the Rev. William Armstrong Russell (1821-79), later (1872-79), bishop of North China. In 1853 John Shaw Burdon (1826-1907), a graduate of Islington College, was sent out to China by the C.M.S. to work under the Right Rev. George Smith, an experienced Chinese scholar and first Anglican bishop of Victoria, Hongkong. Burdon was a pioneer missionary, the first member of the C.M.S. Mission to enter Hangchow, the first at Shaouhing, the first at Yu-yaou, the first at Peking. He visited new cities with Dr. John Livingston Nevius (1819-93), the American Presbyterian, Griffith John (1831-1912) of the London Missionary Society, and James Hudson Taylor (1832-1905), missionary of the Chinese Evangelization Society since 1854, and subsequently founder and director of the China Inland Mission. In 1873 Dr. Burdon was chosen bishop of Victoria as successor to Bishop Charles. Richard Alford, who had resigned. He had also done important work as one of the translators of a new version of the New Testament into the Mandarin dialect direct from the Greek. Together with Samuel Isaac Joseph Schereschewsky (1831-96), the missionary bishop of the Protestant Episcopal Church of America at Shanghai, having jurisdiction in China (1877-83), he completed a Mandarin translation of the Prayer Book into the language of the court and the literati. It was lithographed in roman characters, 1872 (334 pages, 8vo). This translation has formed the basis of all the Prayer Books since printed for the North China Missions. Bishop Burdon prepared further editions in 1879, 1890 and 1893. He died January 5, 1907. Bishop Schereschewsky, who resigned in 1883 owing to ill-health, also translated the Bible into the Mandarin dialect; “strictly speaking the spoken language of China,” and thus the Word of God was opened to vast multitudes of the people. The same bishop likewise translated the whole Prayer Book into the Wen-li, or book language of China (334 pages, 8vo). “The Cambridge seven” went forth to China in 1884-85 in connection with this mission. All were of good family; among them were Stanley Peregrine Smith, Trinity, B.A., 1883. and stroke-oar of the university eight; Charles Thomas Studd, Trinity, B.A., 1883, and captain of the university eleven. Probably no event of recent years exercised a wider influence in the cause of missions. University graduates have since then gone out as missionaries in much larger numbers than before. There are now five missions definitely linked with the universities. The Central African Mission (1858), indeed, is not for the most part manned by graduates, though it is led by them; but the Cambridge Mission at Delhi (1878), the Oxford Mission at Calcutta (1880), and the Dublin Missions at Chhota Nagpur and the Fuh-kien province of China, the one in charge of the S.P.G. work since 1891, and the other serving the C.M.S. since 1887, consist of university men. In 1878 appeared: The Book of Common Prayer, ... according to the Use of the Church of England; the Psalter or Psalms of David, &c. Translated into Cantonese by the Rev. Arthur B. Hutchinson. Hongkong, 8vo. 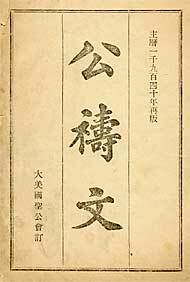 The Chinese title reads: Shing hwuy taou wăn. The Psalter alone was published as early as 1875. This Cantonese version was based mainly on Schereschewsky’s Peking Mandarin version. Arthur Blockey Hutchinson graduated from the C.M.S. College at Islington in 1867. The bishop of London ordered him deacon in 1867, and ordained him priest in 1870. In 1871 he went to Hongkong in charge of St. Stephen Mission Church. He remained there until 1882. He was then transferred to Nagasaki and Fukuoka, Japan, 1882-1907. From 1909 to 1910 he was C.M.S. representative .at Kumamoto, Japan. He is stationed now at Deshima, Nagasaki, Japan, as archdeacon of Kyushyu. George Evans Moule was educated at Corpus Christi College, Cambridge, where he won a Mawson scholarship and graduated B.A. in 1850. He was ordained deacon in 1851, and priest the following year. From 1857 until 1880 he was C.M.S. missionary at Ningpo and Hangchow. He was consecrated in October, 1880, missionary bishop of Mid-China. He resigned his bishopric in 1906, and died March 3, 1912. While at Hangchow Moule translated portions of the Prayer Book, consisting of the Morning and Evening Prayer, the Litany, &c., into the Hangchow colloquial. This. was printed at Hangchow, 1874, in the native character. A considerable part of the translation was published in 1877 by the S.P.C.K. in roman character. About 1860 Singapore had a settlement of 40,000 Chinese, for whose spiritual welfare the Rev. Thomas Cartwright Smyth, the Government chaplain, had earnestly pleaded with the S.P.G. The society complied with his request, and sent out, in 1861, the Rev. Edward Sherman Venn (born 1819), an Oxford graduate. After his death, in 1866, the mission remained without the superintendence of a resident missionary until 1872, when an efficient successor was found in the Rev. William Henry Gomes, translator also of the Prayer Book into Malay and into Dyak. Efforts were at once directed toward holding services in the three languages — Malay, Chinese and Tamil, and Mr. Gomes soon had a large staff of teachers and catechists working under him. By means of translations into Malay and into “Hok-kien colloquial,” using roman characters in both cases, Gomes has enabled those Malays and Straits-born Chinese who can speak their respective languages, but can read it only in the roman character, to join in the services of the Church. He published at Singapore in 1887: The Order for Morning and Evening Prayer and the Administration of the Holy Communion in Hokien colloquial. It was based on Bishop Burdon’s translation. A year later he followed this up with a translation of “The Occasional Offices” in Hok-kien colloquial. In 1901 the S.P.C.K. published for Gomes the translation of the Liturgy, excepting the Psalms, the Athanasian Creed, and the Epistles and Gospels. The English title reads: * The Order for Morning and Evening Prayer, and Administration of the Sacraments, and other Rites and Ceremonies of the Church, according to the Use of the Church of England, in the Hok-kien dialect (Amoy colloquial). Transliterated by the Rev. W. H. Gomes, B.D., Missionary, S.P.G., Singapore, assisted by the Rev. L. C. Biggs, M.A., formerly Colonial Chaplain, Penang. Singapore: Printed at the American Mission Press, for the S.P.C.K. . . . 1901. (8), 216 pages, fcap. 8vo. The initial eight pages contain English title (reverse blank), table of contents in English (reverse blank), Chinese title (reverse blank), and Chinese table of contents (reverse blank). The text begins with the Morning Prayer and ends with A Commination. The only English in the text itself are the headings of the different divisions and offices, placed before the Chinese. This translation was the work of years, carefully prepared with the aid of several Chinese teachers. It supplies a great need. The Chinese Straits-born Christians, who till then attended the services in Malay, of which they had a very imperfect knowledge, were greatly benefited by a Prayer Book in their own colloquial. Gomes, died at Singapore, March 1, 1902. Louis Coutier Biggs graduated at Oxford, B.A. 1863, M.A. 1866, was ordered deacon 1864, and ordained priest in 1865. In 1874 he went to Malacca as chaplain, and was at the same time acting chaplain at Penang in 1875 and 1877, 1878, and at Singapore 1881. He left Malacca in 1885, .and was from that time on until 1897 colonial chaplain at Penang. Owing to failure of health he retired from foreign work and returned to England. In 1893 the S.P.C.K. published for the Chinese Christians of the Straits Settlements a card containing: Amoy Lord’s Prayer, Creed and Ten Commandments, translated by Mr. Biggs. We are glad to say that, according to a report in The Guardian, June 14, 1912, p. 803, the missionary dioceses founded in China by the Church of England, the Protestant Episcopal Church in the United States, and the Church of England in Canada, are to be united in the future as “The Holy Catholic Church of China” (Chung Hua Sheng Kung Hui), following the example of the Nippon Sei Kokwai. They constitute a synod with eleven bishops. The first .general synod was held in Shanghai in April, 1912. Later (1940) Chinese translation of the American BCP. Corea, Korea (Ch’ao Hsien, the land of the “Morning Calm”), renamed by the Japanese, in 1910, Chosan, has a population of some thirteen million people. The Corean language is distinct from that of their neighbours, the Chinese and the Japanese, in its grammatical structure and idioms; but it has borrowed from the Chinese a large number of words. The Chinese character is used in all official and literary writing, and, in fact, in all the literary work of the better class of people. The language was reduced to writing about three hundred years ago. It has an alphabet whose simplicity, flexibility and comprehensiveness compare favourably with those of any other known alphabet. It is unlike both the inflexible syllabary of Japan and the unwieldy ideogrammatic writing of China. It was not until 1882 that a treaty between the United States of America and Corea gave comparative safety to Christians. The bishops of China — Burdon, Moule and Scott — sent a letter to Archbishop Benson petitioning for a mission to Corea. The archbishop appealed to the C.M.S., but the society at that time could do nothing. In 1888 the S.P.G. offered the bishop of North China (Peking) the Right Rev. Charles Perry Scott, the amount of £2,500 for a mission to Corea, and the Rev. C. J. Corfe was consecrated, under royal mandate, the first missionary bishop for Corea, in Westminster Abbey, on All Saints’ Day, November 1, 1889 . Charles John Corfe was born in 1843. He graduated from All Souls’ College, Oxford, B.A. 1865, M.A. 1869. He, was ordered deacon in 1866, and ordained priest the following year by the bishop of Hereford. Before his consecration as bishop of the Church of England in Corea he had been a naval chaplain (1867-89), and had received recognition in the highest quarters for his faithful work. Oxford bestowed upon him an honorary D.D. at the time of his elevation to the bishopric. He resigned his charge in 1905, but has since on various occasions done mission work for the S.P.G. and the Church at large. In 1906 he published an excellent account of The Anglican Church in Corea (London: Rivington). He translated into Corean, for the use of his diocese, portions of the Prayer Book, including the Offices of the Administration of the Holy Communion and Baptism for those of riper years, as well as the Office of Confirmation, Evensong, Litany, about half of the Collects, Epistles and Gospels, together with a few Psalms and Prayers. The translation was revised by members of the mission. One of his main collaborators was the Rev. Mark Napier Trollope, bishop’s chaplain and senior S.P.G. missionary in the diocese of Corea from 1890 until 1902. In 1911 Dr. Trollope was chosen third bishop of the Church of England in Corea. See also The Guardian, May 2, 1913, p. 576, col. 3. JAPAN (Nihón, Nippón, Dai-Nippon) was called during the Middle Ages Zipangu, from the Chinese Dchipönukwo. Nihón is the Chino-Japanese Nitus (sun) and Hon (origin; rise) — land of the sunrise, Orient. For two centuries after the massacre of the Jesuit missionaries in 1637 the country was closed to all foreigners. The gates were first opened to the world through the influence of Americans, and the first Protestant missionaries to enter Japan, in 1859, were Americans. The American and the English Episcopal missionaries have always worked in harmony. Recognizing the fact that in the course of time the native Church Nip(p)on Sei Kokwai, literally “Japanese Church,” usually rendered Holy Catholic Church of Japan), now ministered to by both English and American missionaries and their respective native assistants, would be wholly ordered by the native Japanese clergy, the missionary synod of 1887, in which both Churches convened, ordered the adoption of the English Prayer Book, with some omissions and certain substitutions, partly from the American Prayer Book of 1789. The Prayer Book in the meantime had. been translated into Japanese and printed in the native character by a committee of the two Churches. The first part was printed at Tokio in 1878, the second at Osaka in 1883. The principal members of the committee were Archdeacon Shaw, for the S.P.G. ; the Rev. Messrs. Warren and Piper, for the C.M.S. ; Bishop Williams and the Rev. Mr. Quinby, for the American Church. It was mainly the wisdom of Bishop Bickersteth which guided the joint movement, resulting in a national church, with its own laws and its own missions in Formosa. The Right Rev. Channing Moore Williams, late bishop of the Protestant Episcopal Church of America at Yedo, Japan, was born in Richmond, Virginia, on July 18, 1829. He was ordered deacon in 1855, and left for China as a missionary under Bishop Boone in November of the same year. He was ordained priest in the mission chapel at Shanghai by the bishop on June 11, 1857, and shortly afterwards, by direction of the Foreign Committee of his Church, was transferred to Japan. He was one of the first two Protestant missionaries to enter that country in 1859. He was consecrated missionary bishop in China, with jurisdiction in Japan, in St. John’s Chapel, New York, on October 3, 1866. The General Convention of 1874 relieved him of the China mission and changed his title to Missionary Bishop of Yedo, with jurisdiction in Japan. In 1889 he resigned his office. He died in 1910. Bishop Williams translated from time to time portions of the Prayer Book, long before the joint committee began its work. His American colleague on the translation committee, the Rev. James Hamilton Quinby, came from Monticello, Florida, and was appointed to missionary work in 1872. He worked chiefly at Osaka. While on furlough visiting friends in Florida he died, February 14, 1882. Alexander Croft Shaw was one of the first two S.P.G. missionaries to Japan, beginning his work there in 1873. He was born in 1846 at Toronto, Canada; was ordered deacon in 1869, and ordained priest the following year by the bishop of Toronto. He began his mission work at Tokio. In 1889 he became archdeacon of the diocese of South Tokio, and continued faithfully in the performance of his duties until his death in 1902. He had been for nearly thirty years the principal worker and the director of the S.P.G. mission in Tokio. — Charles Frederick Warren and John Piper were graduates of Islington College. They were sent in 1866 to Hongkong, whence, in 1873, they were transferred to Japan, the former to Osaka, the second city of the empire, the latter beginning work at Tokio in 1874. Owing to the failure of his wife’s health Piper was forced to leave the country and return to England. His literary work, especially his “Reference New Testament” (4,750 pages, 4to), with 12,000 references, has proved to be of the highest value. Owing to his wife’s health Warren also returned to England in 1884. Mrs. Warren died in 1888, and he went out again to Japan, to the great advantage of the work in which he had taken such a prominent part. He was shortly appointed archdeacon by Bishop Bickersteth. The first synod of the Japanese Church, held at Osaka in 1887, considered the revision of the Japanese Prayer Book as a matter of the greatest importance. It was delegated by the synod of 1889 to two committees, the one dealing with translation, the other with structural details. The revision occupied six years of work, and was not issued until September of 1895, when it appeared in octavo form; and the same, romaji edition, 1895, 450. pages, 16mo. A preliminary edition, in 16mo, had appeared in 1891. The revision, based as it is upon the English and the American Book, took the line of filling in omissions from the American Book and adding from the English Book such details of service as had been retained by the English but lost by the American Book. The result, on the whole, has been a gain in liturgical richness for the Japanese Prayer Book. This revision was made chiefly under the guidance of the Right Rev. Edward Bickersteth, lord bishop of the Church of England in South Tokio. Bickersteth was born in 1850, the eldest son of the Right Rev. Edward Henry Bickersteth, bishop of Exeter. He graduated in 1873 B.A. from Pembroke College, Cambridge, was ordered deacon in 1873, and ordained priest the following year. He was head of the Cambridge University mission to Delhi from 1877 to 1884, and examining chaplain to the bishop of Lahore from 1878 to 1884. In 1886 he was consecrated missionary bishop of the Church of England in Japan. He died, in the harness, August 15, 1897. He was the author of The Church in Japan, The Anglican Community in Japan, and A Basis of Christian Union. An estimate of the Revised Japanese Prayer Book of 1895, as compared with the English and American Liturgies, was published by the Rev. A. F. King in the South Tokyo Diocesan Magazine, 1899-1900, and reproduced by Alfreda Arnold in her book, The Light of Japan, pp. 193-206. For the benefit of the Japanese in the Hawaiian Islands the Rev. William Henry Barnes caused portions of the Liturgy to be translated and printed in roman characters. Barnes received his education at St. Augustine’s College, Canterbury. He was ordered deacon in 1885, and ordained priest in 1887, at Honolulu. He was stationed at Honolulu and Lahaina from 1886 to 1892. When the Hawaiian Islands were given over to the American Church Barnes was transferred to one of the Canadian mission stations. From 1903 until 1906 he was rector of St. John’s, New Town, Tasmania. He afterwards held a rectory in England. To the north of Hondo, the principal island of Japan, lies the island of Yezo (= “abounding in game"). It is called by the Japanese Hokkaido, a word of Chinese origin meaning “northern sea-circuit.” Hokkaido, however, includes also the Kurile Isles and several others. At Yezo the larger portion of the remnant of the Ainu (i.e., “the men") is found. The Ainu are the aborigines of the “Great Eight Islands.” They are believed to be of Aryan origin, and to have been conquered in the seventh century B.C. by mixed races from Southern Asia. From these invaders sprang the Japanese. The language of the Ainu stands at the present day altogether isolated. The alphabet was reduced by missionaries to writing in roman characters. The language is spoken by about 16,000 to 20,000 people, living on the islands of Yezo, South Saghalien, the Kurile Isles and various adjacent regions. Until the missionaries arrived the Ainu had no alphabet, no writing, no numbers above a thousand. Mission work among the Ainu was begun for the Episcopal Church in 1874 by the Rev. Walter Dening, at that time connected with the C.M.S. But the missionary par excellence to them has been the Rev. John Batchelor, of the C.M.S., since 1911 archdeacon of Hokkaido. He was one’ of Bishop Burdon’s students at St. Paul’s College, Hongkong, and in 1880 accompanied Mr. Dening to Sapporo, making his first visit to the Ainu settlements in that district and beginning the study of their language. He stayed at their chief settlement and old capital, Piratori, twice for more than a month in 1881; and, after a visit to England and a time of study at Islington, he went back in 1883 and threw himself heart and soul into the work among this strange and wild people. His subsequent studies in the Ainu language, customs and traditions, made him gradually the greatest authority on the subject, and his writings have gained him a high reputation in scientific circles, earning for him the coveted title of F.R.G.S. As the Ainu race, and especially their language, is dying out, and its numbers decrease from year to year, the scholarly work of Batchelor will be of the greatest importance to the science of ethnology. * Ainu Karisia | Eiwange gusu an | Inonno-itak oma. kambi. The Book of Common Prayer. Translated into Ainu, By the Rev. John Batchelor (Church Missionary Society). S.P.C.K., London . . . 1896. Reverse blank; page (3) Contents, reverse blank. The text commences with the Order for Morning Prayer. ANDREWS, C. F. North India. Lo. ’08. — Anglican Missions in North India. AZARIAH, V. S. India and Missions. Calcutta, ’08. — Mission study text-book, written by one of the leaders of the Indian Church. BARNES, I. H. Behind the Pardah. The story of C.E.Z.M.S. work in India. N.Y. ’97. Illus. Plates. 12mo. BARRETT, J. The Duty of Britons to Promote the Progress of Christianity and Civilization in India. Lo. 1813. 12mo. BARROWS, J. H. The Christian Conquest of Asia. N.Y. ’98. 12mo. BARRY, A. England’s Mission to India. Lo. ’95. 8vo. BATEMAN, J. Daniel Wilson. Lo. ’60. 2V. 8vo. BELL, C. D. Henry Martyn. Lo. ’80. Sm. 8vo. BERRY, T. S. Christianity and Buddhism: A Comparison and a Contrast. Lo. ’91. [Non-Christian Religious Systems.] Sm. 8vo. BOETZELAER VAN DUBBELDAM, C. W. T. VAN. De Gereformeerde kerken in Nederland en de zending in Oost-Indië in de dagen der Oost-Indische Compagnie. Utrecht, ’06. 8vo. BUCHANAN, C. Apology for Promoting Christianity in India. Boston, ’14. 24mo. —— Colonial Ecclesiastical Establishment. Added, a sketch of an ecclesiastical establishment for British India. 2nd edition. Lo. 1813. 8vo. —— Memoir of the Expediency of an Ecclesiastical Establishment in British India. 1st American edition. Cambridge, 1811. 8vo. CAMPBELL, G. Specimens of Languages of India, including those of the Aboriginal Tribes of Bengal. . . . Calcutta, ’74. Fo. CAREY, W. Serampore Letters. Being the unpublished correspondence of William Carey and others with John Williams, 1800-1816. Edited by LEIGHTON and MORNAY WILLIAMS. N.Y. ’92. Illus. Portraits. 16mo. CHAMBERLAIN, JACOB. The Kingdom in India. Its ’Progress and its Promise. With a biographical sketch by H. N. Cobb. N.Y. ’08. Portraits. Plates. 8vo. CORNISH, F. W. The English Church in the Nineteenth Century. Vol. 1, pp. 52-61; 2, pp. 373 foll. CROOKE, W. Natives of Northern India. Lo. ’07. Plates. Map. [The Native Races of the British Empire.] 8vo. CUST, R. N. A Sketch of the Modern Languages of the East Indies. Lo. ’78. [Trübner’s Oriental Series.] 8vo. DOUGLAS, SIR ROBERT K. Europe and the Far East. Cambridge, ’04. Maps. Plans. [Cambridge Historical Series, 22.] Sm. 8vo . EDWARDS, H. B. Prospect of Triumph of Christianity in India. Lo. ’66. 12mo. ELLIS, H. W. Denmark and Her Missions. Lo. ’63. [2nd edition, ’64]. 8vo. ELWIN, E. F. Indian Jottings. Lo. ’07. — Narrative of the work of the Cowley Fathers in Poona district, mainly among boys. —— India and the Indians. Lo. ’12. Illus. 8vo. —— Thirty-nine Years in Bombay City; being the History of the Mission Work of the Society of S. John the Evangelist in that City. Lo. Mowbray, ’13. 8vo. FRERE, SIR H. B. E. Indian Missions. Lo. ’73. Sm.8vo. FULLER, SIR J. B. The Empire of India. Lo. ’13. Plates. Map. [The All-Red Series.] 8vo. GRIERSON, G. A., compiler and editor. Linguistic Survey. of India. Calcutta, ’03. Maps. Fo. As far as published, namely: 2 Mon-Khmer and Siamese-Chinese families; 3 Tibeto-Burman family; 4 Munda and Dravidian languages; 5-9 Indo-Aryan family. HACKMANN, H. Welt des Ostens. Berlin, ’12. Map. 8vo. — An ecellent account of the religious conditions in China, Japan, India and Siam. HALL, C. C. Christ and the Eastern Soul. Chicago, ’09. [University of Chicago. Lectures. Barrows Lectures, 1906-7:] 8vo. HERKMEIJER, F. C. De Rechtstoestand der Inlandsche Christen en in Nederlandsch-Indië. Utrecht, ’92. 8vo. HOERNLE, J. F. D. “Per Crucem ad lucem.” Memoir of Christian Theophilus Hoernle, compiled from his diaries and other papers, with a preface by Sir W. Muir, and introductory remarks by the bishop of Lahore [Thomas Valpy French]. Dorking, ’84. Portrait. Sm. 8vo. — An account of missionary labours in Persia from 1832 to 1837 and in North India from 1838 to 1881. HOUGH, J. History of Christianity in India from the Commencement of the Christian Era. 5 vols. Lo. ’39. 8vo. HOOLE, ELIJAH. Personal Narrative of a Mission to the South of India, from 1820 to 1828. . . . Lo. ’29 8vo. HOWELLS, G. The Soul of India. Lo. ’13. 8vo. JONES, J. P. India: its Life and Thought. N.Y. ’08. Plates. 8vo. —— India’s Problem: Krishna or Christ? N.Y. ’03. Portraits. Plates. 8vo. KAYE, SIR J. W. The Administration of the East India Company. Lo. ’53. 8vo. LEUPOLT, C. B. Recollections of an Indian Missionary. 2nd edition. Lo. [’63.] 12mo. —— Further Recollections of an Indian Missionary. Lo. ’84. 8vo. MASON, C. A. Lux Christi. An outline study of India. A twilight land. N.Y. ’09. Plate. [United Study of Missions, 2.) 12mo. MILMAN, ROBERT. Memoir, with a selection from his correspondence and journals. By his sister, Frances Maria Milman. Lo. ’79. Map. 8vo. MULLENS, J. Missions in South India Visited and Described. Lo. ’54. 8vo. MURDOCH, J. Indian Missionary Manual. Hints to young missionaries in India; with lists of books. 2nd edition. Lo., ’70. 12mo. MYLNE, L. G. Missions to Hindus. A contribution to the study of missionary methods. Lo. ’08. 8vo. PAGE, JESSE. Henry Martyn: His Life and Labours: Cambridge, India, Persia. N.Y. ’90. Illus. 12mo. PALMER, R. A Little Tour in India. Lo. ’13. 8vo. PARLBY, B. B. A Brief Sketch of the Establishment of the Anglican Church in India. Lo. ’51. 12mo. PEARSON, H. Memoirs of the Life and Correspondence of the Reverend Christian Frederick Swartz. Prefixed a sketch of the History of Christianity in India. Lo. ’34. 2 vols. Portrait. Map. 8vo. PETTIT, G. The Tinnevelly Mission of the Church Missionary Society. Lo. ’51. 12mo. RHENIUS, C. T. E. Memoirs . . . comprising extracts from his journals and correspondence, with details of Missionary Proceedings in South India. By his son [J. Rhenius.] Lo. ’41. Sm. 8vo. RICHTER, JULIUS. Indische Missionsgeschichte. Gütersloh, ’06. Illus. Plates. 8vo. —— History of Missions in India. Lo. ’08. — The best book on Christian missions in India. SARGENT, J. Memoir of Henry Martyn. Boston, ’36. 12mo. SHERRING, M. A. The History of the Protestant Missions in India. Lo. ’84. Sm.8vo. SLATER, T. E. The Higher Hinduism in Relation to Christianity ... With an introduction by the late . . . John Henry Barrows. Lo. ’06. Sm.8vo. SMITH, G. Henry Martyn, Saint and Scholar. Lo. ’92. Illus. Portrait. 8vo. — The standard biography of the most spiritual of early Indian missionaries. —— Reginald Heber. Lo. ’95. —— John Wilson. Lo. ’7g. STOCK, E. Notes on India for Missionary Students. Lo. ’05. Story of the Cawnpore Mission. Lo. S.P.G. ’09. Story of the Delhi Mission. Lo. S.P.G. ’08. SURGUNER, S. Bishop Caldwell and the Tinnevelly Shanars. Palamcottah, ’83. 12mo. THOBURN, J. M. India and Malaysia. Cincinnati, ’96. Illus. Portraits. Plates. 8vo. TISDALL, W. ST. CLAIR. Manual of Leading Muhammadan Objections to Christianity. Lo. ’04. 8vo. —— The Religion of the Crescent; or, Islam: its Strength, its Weakness, its Origin, its Influence. Lo. ’95. [Non-Christian Religious Systems.] Sm. 8vo. —— India: its History, Darkness and Dawn. Lo. ’01. TUCKER, SARAH. South Indian Sketches; containing a short account of some of the missionary stations. 3rd edition. Lo. ’48. 12mo. TYERMAN, D., and GEORGE BENNET. Journal of Voyages and Travels by Dr. Tyerman and G. Bennet, deputed from the London Missionary Society to visit their various stations in the South Sea Islands, China, India, etc., 1821-29. Compiled by J. MONTGOMERY. Lo. ’31. 2 vols. Portraits. Illus. 8vo. WARD, F. DE WILTON. India and the Hindoos: being a popular view of the geography, history . . . with an account of Christian Missions among them. N.Y. ’50. Plates. Map. 12mo. WHITEHEAD, E. Sketch of the Established Church in India. Lo. ’48. 12mo. WILBERFORCE W. Substance of the Speeches of William Wilberforce on the Clause of the East-India Bill for Promoting the Religious Instruction and Moral Improvement of the Natives of the British Dominions in India. In Pamphleteer. Lo. ’14 .. Volume VIII, pp. 43-113. WILSON, D. Aus Bischof Wilson’s “Missionsreden über Indien.” In Hoffmann, Missions-Stunden. Vol. II, pp. 160-338. Stuttgart, ’51. —— Sermons delivered in India during the Course of the Primary Visitation. 3rd edition. Calcutta, ’40. 8vo. ZWEMER, S. M. The Unoccupied Mission Fields of Africa and Asia. Lo. ’11. Portraits. Plates. Maps. 8vo. BEAMES, J. A Comparative Grammar of the Modern Aryan Languages of India: to wit, Hindi, Panjabi, Sindhi, Gujarati, Marathi, Oriya and Bangali. Lo. ’72-79. 3 vols. 8vo. British Museum, London. Library. Catalogue of Bengali printed books in the library of the British Museum. By J. F. BLUMMHARDT. Lo. ’86. 4to. —— Catalogue of Hindustani printed books ... with supplementary catalogue. By J. F. BLUMHARDT. Lo. ’89, ’09. 2 vols. 4to. —— Catalogue of Marathi and Gujarati printed books .... By J. F. BLUMHARDT. Lo. ’92. 4to. BUTLER, J. A Sketch of Assam: with some account of the Hill Tribes. Lo. ’47. Illus. Plates. Map. 8vo. CHATTERTON, EYRE. The Story of Fifty Years’ Mission Work in Chota Nagpur. Lo. ’01. 8vo. CLARK, H. M. Robert Clark, of the Panjab, Pioneer and Missionary Statesman. Lo. ’07. Portraits. Facsimile. 8vo. — Relates principally to the Punjab and Cashmere. CLARK, R. Punjab and Sindh Missions of the C.M.S. from 1852 to 1884. Lo. ’85. COTTON, SOPHIA ANNE. Memoir of George Edward Lynch Cotton, D.D., Bishop of Calcutta and Metropolitan. With selections from his journals and correspondence. Edited by MRS. COTTON. Lo. ’71. Portrait. Map. 8vo. DEL MAR, W. The Romantic East: Burma, Assam and Kashmir. Lo. ’06. Portraits. Plates. 8vo. GRIERSON, G. A. A Manual of the Kashmīrī Language, comprising Grammar, Phrase-Book and Vocabularies. Oxford, ’11. 2 vols .. 12mo. Historical and Ecclesiastical Sketches of Bengal from the Earliest Settlement until the virtual Conquest of that Country by the English in 1757. Calcutta, ’29. 8vo. KEENE, H. G. Hindustan under Free Lances, 1770-1820. . . . With a preface by Sir Richard Temple. Lo. ’07. Portraits. Plate. Folded map. 8vo. KNOWLES, S. The Gospel in Gonda. ’89. 8vo. LONG, J. Handbook of Bengal Missions, in connexion with the’ Church of England. Lo.’ 48. 8vo. LONGRIDGE, G. A History of the Oxford Mission to Calcutta.. . . Lo. ’00. Portraits. Plates. 8vo. MACKENZIE, G. T. Christianity in Travancore. Trivandrum, ’01. 12mo. MATHER, S. Native Life in Travancore. Lo. ’83. Illus. Map. 8vo. PENNY, FANNY EMILY. Fort St. George, Madras: a short history of our first possession in India. Lo. ’00. Plates. Maps. Facsimile. 8vo. PENNY, F. The Church in Madras, being the History of the Ecclesiastical and Missionary action of the East India Company in the Presidency of Madras in the Seventeenth and Eighteenth Centuries. Lo. ’04. Plates. 8vo.-Vol. II, ’12, continuing: the history down to 1835. RISLEY, H. H. The Tribes and Castes of Bengal. Calcutta. ’91, 92. 2 vols. 8vo. WADE, T. R. A Grammar of the Kashmīrī Language, as spoken in the Valley of Kashmir, North India. . . . Lo. ’88. 8vo. WARING, E. S. A History of the Mahrattas: prefixed, an historical sketch of the Decan, containing a short account of the rise and fall of the Mooslim sovereignties prior to the æra of Mahratta. independence. Lo. 1810. 4to. WYLIE, M. Bengal as a Field of Missions. Lo.’ 54. 8vo. BOMPAS, C. H., compiler and translator. Folklore of the Santal: Parganas. Lo. ’09. 8vo. BRADLEY-BIRT, FRANCIS BRADLEY. Chôta Nagpore, a little-known Province of the Empire. With an introduction by the Earl of Northbrook. Lo. ’03. Plates. Map. 8vo. ——. The Story of the Indian Upland. Lo. ’05. Portraits. Plates. Maps. 8vo. Brief Sketch of the American Ceylon Mission. . . . Jaffna, ’49. 12mo. BROWNE, J. C. The Chôta Nagpore Mission to the Kols. Lo. ’71. 16mo. BURKHARDT, G. E. Die Evangelische Mission in Ceylon und Hinter-Indien. 2. Auflage. Bielefeld, ’70. 8vo. CALDWELL, R. A Comparative Grammar of the Dravidian or South-Indian Family of Languages. 2nd edition. . . . Lo. ’75. 8vo. —— Records of the Early History of the Tinnevelly Mission of the S.P.G. Madras, ’81. 8vo. CHAMBERLAIN, J. In the Tiger Jungle, and Other Stories of Missionary Work among the Telugus of India. . . . N.Y. ’96. Portraits. Plates. 12mo. CHAPMAN, JAMES. Memorials of James Chapman, D.D., First Bishop of Colombo. Lo. ’92. 8vo. CLOUGH, J. E. From Darkness to Light: a story of the Telugu awakening. Boston, ’82. Portrait. Illus. 16mo. GEHRING, H. Süd-Indien. Land und Volk der Tamulen. Gütersloh, ’99. Illus. Plates. Map. 8vo. GRAY, A. H. Thomas of Tinnevelly. Lo. ’04.-For thirty years a missionary to the Tamils. HAHN, FERDINAND. Einführung in das Gebiet der Kols-Mission. Geschichte, Gebräuche, Religion und Christianisierung der Kols. Gütersloh, ’07. 8vo. ——, compiler. Blicke in die Geisteswelt der heidnischen Kols. Sammlung von Sagen, Marchen und Liedern der Oraon in Chota Nagpur. Gütersloh, ’06. 8vo. HANDMANN, R. Die Evangelisch-lutherische Tamulen-mission in der Zeit ihrer Neubegründung. Leipzig, ’13. Illus. Plates. Maps. 8vo. HIBBERT-WARE, G. Christian Missions in the Telugu Country. Westminster, ’12. Illus. Plates. Map. 12mo. HOWLAND, W. W. Historical Sketch of the Ceylon Mission, by W. W. Howland, and of the Madura and Madras Missions, by Rev. J. Herrick. Boston, ’65. Map. 8vo. RULBERT, H. B. A Comparative Grammar of the Korean Language and the Dravidian Languages of India. Seoul, ’05. 8vo. LEITCH, M. and M. W. LEITCH. Seven Years in Ceylon. Stories of mission life. N.Y. ’90. Illus. Portraits. Map. 4to. NOTTROTT, L. Die Gossnersche Mission unter den Kohls. Halle ’74. 8vo. POPE, G. U. A Handbook of the Ordinary Dialect of the Tamil Language. 7th edition. Oxford, ’04-06. 4 vols. Tables. 8vo. SELKIRK, JAMES. Recollections of Ceylon, After a Residence of Nearly Thirteen Years; with an account of the Church Missionary Society’s operations in the island; and extracts from a journal. Lo. ’44. Plates. Map. 8vo. SHARROCK, J. A. South Indian Missions. Containing glimpses. into the lives and customs of the Tamil people. Revised edition. Westminster, ’10. Portraits. Plates. 12mo. —— Robert Caldwell, Coadjutor-Bishop of Madras. Madras. ’96. 8vo. TENNENT, SIR J. E. Christianity in Ceylon. Lo. ’50. 8vo. AYMONIER, E. Les Tchames et leurs religions. Paris, ’91. 8vo. BIRD, G. W. Wanderings in Burma. . . . Bournemouth, ’97. 8vo. BOYLE, F. Adventures among the Dyaks of Borneo. Lo. ’65. Plate. 8vo. BRAYTON, D. L. A Primer of the Pwo-Karen Language. Rangoon. ’84. 12mo. BROOKE, CHAS. [His Highness Rajah]. Ten Years in Sarawak. With an introduction by H. H. the Rajah, Sir James Brooke. Lo. ’66. 2 vols. 8vo. BROWN, A. J. and S. M. ZWEMER. The Nearer and Farther East. Outline studies of Moslem lands and of Siam, Burma, and Korea. N.Y. ’08. [United study of missions.] 12mo. BUNYON, C. J. Memoirs of Francis Thomas McDougall, sometime Bishop of Labuan and Sarawak, and of Harriette, his Wife, Lo. ’80. Portraits. 8vo. CATOR, D. Everyday Life among the Head-Hunters. . . . Lo. ’05· Portraits. Plates. 8vo. — Travels in Borneo and the West Coast of Africa. CHALMERS, W. Some Account of the Land of the Dyaks of Upper Sarawak. . . . Singapore, n.d. 4to. COCHRANE, W. W. The Northern Shans: a brief historical outline. Language and literature. Plates. Map. In Milne, Mrs. L.. see below. —— H. P. Among the Burmans. N.Y. ’04. COLBECK, J. A., editor. Letters from Mandalay. Knaresborough, ’92. 8vo. COLQUHOUN, A. R. Among the Shans. Lo. ’85. 8vo. —— Burma and the Burmans. Lo. [’85]. 8vo. CONANT, H. C. The Earnest Man. A sketch of the character and labours of Adoniram Judson, first missionary to Burmah. Boston, ’56. Portrait. 12mo. CROSTHWAITE SIR C. H. T. The Pacification of Burma. Lo. ’12. Portraits: Plates. Map. 8vo. DAUTREMER, J. A. Une Colonie Modèle. La Birmanie sous le régime britannique. Paris, ’12. Plates. Map. 8vo. Also English translation, Burma under British rule. Lo. ’13. Plates. Map. 8vo. FURNESS, W. H. The Home Life of Borneo Head-Hunters: its Festivals and Folk-lore. Philadelphia, ’02. Illus. Portraits. Plates. L. 8vo. GOMES, E. H. Seventeen Years Among the Sea Dyaks of Borneo: A Record of Intimate Association with the Natives of the Bornean Jungles. . . . Lo. ’11. Portrait. Plates. Map. 8vo. GRANT, C. T. C. A Tour Amongst the Dyaks of Sarawak, Borneo, in 1858. With additional notes up to 1864. Lo. ’64. 8vo. — Contains two chapters on the Dyak language by W. Chalmers. GREEN, EDA. The Land of River and Palm. 3rd edition. Lo. ’13. — A book on Borneo. HARDELAND, AUGUST. Versuch einer Grammatik der dajackschen Sprache. . . . Amsterdam, ’58. 8vo. HOSE, C. In the Heart of Borneo. In Geographical Journal, Vol. 16.Lo. ’09. HOSE, C., and W. MCDOUGALL. The Pagan Tribes of Borneo. Their physical, moral and intellectual condition, with some discussion of their ethnic relations. With an appendix on the physical characters of the races of Borneo, by A. C. Haddon. Lo. ’12. 2 vols. Illus. Plates. Maps. 8vo. JUDSON, ADONIRAM. A Cry from Burmah. ’31. 12mo . JUDSON, ANN. A Particular Relation of the American Baptist Misssion to the Burman Empire. Washington, ’23. 12mo. JUDSON, E. The Life of Adoniram Judson. Philadelphia, ’04. KLOSS, C. R. In the Andamans and Nicobars. . . . Lo. ’03. Illus. Plates. Maps. 12mo. KNOWLES, S. The Gospel in Gonda. Lo. ’89. 8vo. MCDOUGALL, HARRIETTE. Sketches of Our Life at Sarawak. Lo. ’82. Illus. Map. Sm. 8vo. MCMAHON, A. R. The Karens of the Golden Chersonese. Lo. ’76. Illus. Map. 8vo. MASON, F. Synopsis of a Grammar of the Karen Language, Embracing both Dialects, Sgau and Pgho or Shoo Tavoy, ’46. 4to. MASON, MRS. F. Civilizing Mountain Men, or Sketches of Mission Work Among the Karens. Lo. ’82. 12mo. MILNE, MRS. L. Shans at Home. With two chapters on Shan history and literature by the Rev. W. W. Cochrane. Lo. ’10. Illus. Portrait. Plates. Map. 8vo. MOFFAT, R. The White Foreigners from over the Water. The story of the American mission to the Burmese and the Karens. Lo. [’62?]. Illus. Plates. Sm. 8vo. MONTGOMERY, H. H. The Church in Singapore and the Malay States. In Guardian, August 23, 1912, pp. 1,070, 1,071. NISBET, J. Burma under British Rule-and Before. Westminster, ’01. 2 vols. Plates. Maps. 8vo. PURSER, W. C. B. Christian Missions in Burma. . . . Westminster, ’11. Portraits. Plates. Map. 12mo . RICHINGS, E. Through the Malay Archipelago. Lo. [’10]. 8vo. ROTH, H. L. The Natives of Sarawak and British North Borneo. Lo. ’96. 2 vols. Illus. Plates. 8vo. SANGERMANO, VINCENTIUS. The Burmese Empire. Rangoon, ’33. 8vo. —— The Burmese Empire, a Hundred Years Ago, as Described by Father Sangermano. With an introduction and notes by J. Jardine. Westminster, ’93. 8vo. SCHADEE, M. C. Bijdrage tot de Kennis van den godsdienst der Dajaks van Landak en Tajan. ’s Gravenhage, ’05-’07. 8vo. SCOTT, SIR J. G. Burma: a handbook of practical information. Lo. ’11. Plates. Map. Table. 8vo. —— Burma: as it was, as it is, and as it will be. Lo. ’86. Sm. 8vo. —— The Burman: His Life and Notions. 3rd edition. Lo. ’10. 8vo. SMEATON, D. M. The Loyal Karens of Burma. Lo. ’87. 8vo. STUART, J. Burma Through the Centuries. Lo. ’09. 8vo . TITCOMB, J. H. Personal Recollections of British Burma and its Church Mission Work in 1878 and 1879. Lo. ’80. 8vo. — On the early work of the S.P.G. WADE, JONATHAN. Karen vernacular grammar. Maulmein, ’61. 8vo. —— A Vocabulary of the Sgau Karen Language. Tavoy, ’49. 8vo. —— and MRS. J. P. BINNEY. The Anglo-Karen Dictionary. Rangoon, ’83. 4to. WRIGHT, A. and T. H. REID. The Malay Peninsula. A record of British progress in the Middle East. N.Y. ’12. Plates. Map. 8vo. WYLIE, MRS. M. The Gospel in Burmah. Calcutta, ’59. 12mo. BEACH, H. P. Princely Men in the Heavenly Kingdom. N.Y. ’07. Portraits. Plates. Map. [Mission study reference library, 7,] 12mo. — One of the volumes of the Forward Mission study course. BOONE, W. J. Address in Behalf of the China Mission. N.Y. ’37. 8vo. BROOMHALL, M. Faith and Facts. Philadelphia. — Refers to the China Inland Mission. —— editor. The Chinese Empire: A General and Missionary Survey. Lo. [’07]. Portraits. Plates. Map. 8vo. —— Martyred Missionaries of the China Inland Mission, with a Record of Perils and Sufferings of some who Escaped. Lo. ’01. Illus. Portraits. Plates. Maps. Tables. Facsimiles. 8vo. —— Last Letters and Further Records of Martyred Missionaries of the China Inland Mission. Lo. ’01. Portraits. Plates. 8vo. “Century of Missions in China.” N.Y. ’07.-A succinct account of all missionary operations in China. CORFE, C. J. The Anglican Church in Corea. Lo. ’07. 8vo. DEAN, W. The China Mission. Embracing a history of the various missions of all denominations among the Chinese. With biographical sketches of deceased missionaries. N.Y. ’59. 12mo. Episcopal Missions in China. [Hartford, ’93.] Illus. Plate. Map. [A round robin to the Junior auxiliary, 4,] 12mo. ESTES, C. S. Christian Missions in China. A dissertation . . . ’95. [Baltimore, ’96.] 8vo. FENWICK, MALCOLM C. The Church of Christ in Corea. N.Y. (’11) Portraits. Plates. 8vo. GIBSON, J. C. Mission Problems and Mission Methods in South China. 2nd edition. N.Y. [’01]. Portraits. Plates. Maps Tables. [Mission Study reference library, 7.] 12mo. GUINNESS, G. Story of the China Inland Mission. Lo. ’94 8vo. — The standard history. GRUNDEMANN,. P. R. Die jüngsten chinesischen Wirren in ihrer Bedeutung fUr die protestantische Mission. Illus. In Werkshagen, Der Protestantismus am Ende des XIX Jahrhunderts. Band 1, pp. 547-550. Berlin, ’02. GUETZLAFF, C. F. A. The Journal of Two Voyages along the Coast of China, in 1831, & 1832. With notices of Siam, Corea and the Loo-Choo Islands, and remarks on the policy, religion, &c., of China. N.Y. ’33. 12mo. JOHN, G. Griffith John. The story of fifty years in China. By R. WARDLAW THOMPSON. 2nd edition. Lo. ’06. Portraits. Plates. Map. Facsimiles. 8vo. LIN SHAO-YANG. A Chinese Appeal to Christendom Concerning Christian Missions. N.Y. ’11. 8vo. LONGFORD, J. H. The Story of Korea. N.Y. ’11. Portraits. Plates. Maps. 8vo. MICHIE, A. China and Christianity. Boston, ’00. 8vo. —— The Political Obstacles to Missionary Success in China. Hongkong, ’01. 8vo. —— Missionaries in China. Lo. ’91. 8vo. MILNE, WM. A Retrospect of the First Ten Years of the Protestant Mission to China. Malacca, ’zoo 8vo. —— W. C. Life in China. Lo.’58. MORRISON, ELIZA ARMSTRONG. Memoirs of the Life and Labours of Robert Morrison, D.D. . . . Compiled by his widow. With critical notices on his Chinese works, by Samuel Kidd; and an appendix containing original documents. Lo. ’39. 2 vols.’ Portrait. Plate. 8vo. MORRISON, ROBERT. Memoirs of . . . Wm. Milne, Late Missionary to China Compiled from documents written by the deceased Malacca, ’24. 8vo. MOULE, A. E. New China and Old. Lo. ’97. 3rd edition. ’02. 8vo. MOZO, A. Noticia Historico Natural de los Gloriosos Triumphos y Felices Adelantamientos Conseguidos en el presente siglo por los Religiosos del orden de N.P.S. Augustin en las islas Philipinas, yen el grande imperio de la China. . . . Madrid, 1763. 4to. NEVIUS, HELEN S. COAN. The Life of John Livingston Nevius, for Forty Years a Missionary in China. N.Y. ’95. Portraits. Plates. Map. 8vo. NORRIS, F. L. China. Lo. ’08. — Clear and concise account of Anglican Missionary work in China. PHILIP, R. William Milne. Philadelphia,’ 40. Protestant Episcopal Church in the United States. . . . An historical sketch of the China Mission of the Protestant Episcopal Church in the U.S.A. From the first appointments in 1834 to include the year ending 31st August, 1884. N.Y. ’85. Plates. 8vo. SCOTT, C. P. Church Work in China. Lo. ’91. 8vo. SMITH, A. H. Rex Christus. An outline study of China. N.Y. ’08. [United Study of missions, 3.] 12mo. —— The Uplift of China. N.Y. ’07. Portraits. Plates. Map. Table. [Forward mission study courses, 9.] 12mo. STANFORD, E. Atlas of the Chinese Empire Containing Separate Maps of the Eighteen Provinces of China Proper . . . and of the four great dependencies . . . with an index to all the names on the maps and a list of all Protestant mission stations, etc. Lo. ’08. Fo. Story, The, of the China Inland Mission. New edition, with all statistics and maps brought up to June, 1900. Lo. 2 vols. 8vo. TAYLOR, DR. and MRS. HOWARD. Hudson Taylor in Early Years. Lo. ’11. Portraits. Plates. Maps. 8vo. —— M. G. Story of the China Inland Mission. Lo. ’93. 2 vols. 8vo. WILLIAMS, S.W. The Middle Kingdom. 2nd edition. 2 vols. N.Y. ’83. 8vo. ABBOTT, E. Japan and the Nippon sei Kokwai (the Holy Catholic Church of Japan): a sketch of the work of the American Episcopal Church. Hartford, ’00. Illus. Plates. Map. [Soldier and servant series, 23.] 12mo . ARNOLD, ALFREDA, The Light of Japan. Church work in the dioceses of South Tokyo, Osaka and Kiushu, under the Church of England. . . . Hartford, ’06. Portraits. Plates. Map. [Soldier and servant series, April, 1906. Extra number.] 12mo . — Summary of all the Anglican work in Japan. AWDRY, F. Daylight in Japan. Lo. ’04. — Educational work of the S.P.G. in Tokyo. BATCHELOR, JOHN. The Ainu and Their Folk-lore. Lo. ’01. Illus. Plates. 8vo. —— The Ainu of Japan. The religion, superstitions and general history of the hairy aborigines. Lo. ’92. Illus. Sm. 8vo. —— An Ainu-English-Japanese Dictionary (Including a Grammar of the Ainu Language). 2nd edition. Tokyo, ’05. 8vo. —— Sea-girt Jezo. Glimpses at missionary work in North Japan. Lo. ’02. Illus. Portraits. Plates. 8vo. BICKERSTETH, SAMUEL. Life and Letters of Bishop Edward Bickersteth, of South Tokyo. Lo. ’99. 8vo. —— MRS. E. Japan. Lo. ’05. — The work and position of the Anglican church in Japan. CADDELL, C. M. The Cross in Japan: A History of the Missions of St. Francis Xavier and the Early Jesuits. New edition. . . . Lo. ’04. [The Granville popular library.] 12mo. CARY, OTIS. A History of Christianity in Japan. N.Y. ’09. 2 vols. Maps. 8vo. Vol. 1. Roman Catholic and Greek orthodox missions; 2. Protestant missions. — The best single work on missions in Japan. CHAMBERLAIN, B. H. The Language, Mythology, and Geographical Nomenclature of Japan Viewed in the Light of Aino Studies . . . Including an Ainu grammar, by J. Batchelor, and a catalogue of books relating to Jezo and the Ainos. Tokyo, ’87. 4to. —— Things Japanese. Lo. ’02. — Books by the foremost English authority on Japan. COBBOLD, G. A. Religion in Japan: Shintoism, Buddhism, Christianity. Lo. ’94. Plates. Sm. 8vo. Episcopal Missions in Japan. [Hartford, ’92.] Plates. [A round robin to the Junior Auxiliary, 3.] 12mo. GRIFFIS, W. E. Dux Christus. An outline study of Japan. N.Y. ’04. Map. [United study of missions.] 12mo. — And other books by the author, one of the foremost American writers on Japan. JMAI, J. T. Bushido in the Past and in the Present. Lo. S.P.G. ’06. — Best short statement and explanation of the subject. MITSUKURI, KAKICHI. Ein Beitrag zur Geschichte der japanischen Christen im 17. Jahrhundert. [Tokio,? ’01?] 193-223 pp. 8vo. MOORE, H. Christian Faith in Japan. Lo. S.P.G. ’04. — S.P.G. work in Japan. PILSUDSKI, B. Materials for the Study of the Ainu Language and Folk-lore. Cracow. Imperial Academy of Sciences. ’12. L. 8vo. Protestant Episcopal Church in the United States. A historical sketch of the Japan mission. N.Y. ’83. Plates. 8vo. STEICHEN, M. Les Daimyó chrétiens; ou, un siècle de l’histoire’ religieuse et politique du Japon, 1549-1650. Hongkong, ’04. 16mo. STOCK, EUGENE. Japan and the Japan Mission of the C.M.S. 4th edition. Lo. ’05. Illus. 8vo. WENCKSTERN, FRIEDRICH VON. A Bibliography of the Japanese Empire. Leiden. Brill, ’95-’07. Vols. I, II. 8vo.